Given the lack of a British Empire in this world, there are many fewer democracies than in the real world. Instead, there are many more autocracies of various kinds, a significant number of them with governments derived from the French system. Former and current French colonies in particular tend to have a monarchy or other absolutist form of government. Though many nations have become freer over time due to popular movements, many have also become less free. Most political philosophies have been influenced by ideas from the UER, Rationalist, Universalist, Naturist and Naturalist philosophies. French political thinking has also been influenced its experience in India. Many eastern political philosophies have been influenced by Nayaa Rasta. The world is largely free, but it also has much less privacy than in the real world. In many places the Nullopticon movement has ensured that this lack of privacy applies to both the governed and the government. The French Empire and its allies, including the Spanish Empire and the OSU. The Union and its allies, including the Comunidade Portuguese. The Traditionalists, made up of France and the OSU, though there are problems with this given that the OSU is considerably more Progressive than France. They are conservative and oppose what they see as too much 'progress' in many areas. The Progressives, made up of the Union and, to a lesser extent, Russia. They consider continuing technological advancement to be the only way forward. This is much like socialism in the real world, though without stigma that Communism has caused to become attached to it there. The OSU is an example of a socialist state. The Union is an example of this, although most of its constituent states are not. Sweden is an example of this, as is Russia. Such as practised in the OSU and Columbia. Many of the nations of the world fall into this category. Physiocracy is an economic theory that considers that the wealth of nations is derived solely from agriculture. It originated in France in the eighteenth century and was perhaps the first well developed theory of economics. The Physiocrats dislike cities for their artificiality and instead praise more 'natural' styles of living, celebrating farmers in particular. They see the true wealth of a nation as being determined by the surplus of agricultural production over and above that needed support agriculture itself. Other forms of economic activity, such as industry and manufacturing, are viewed as taking this surplus agricultural production and transforming it into new products. While these manufacturers and other non agricultural workers may be useful, they are seen as 'sterile' in that their income derives ultimately not from their own work, but from the surplus production of the agricultural sector. Physiocracy is strongly opposed to mercantilism (which emphasised the trade of goods between countries), as it pictures the peasant society as the economic foundation of a nations wealth. In addition to the French-influenced world, many Colombian and Lousianan policies are based on Physiocratic principles. A modification of the Physiocratic system that sees that, as society evolves (advances), industry inevitably becomes as important as agriculture in underpinning society. It has a flag that is vertically divided, with half gold (for agriculture) and half black (for the coal that powers industry). A political/economic philosophy based on the works of Jeremy Bentham and expanding on them, particularly Utilitarianism and the Felicific Calculus. It was invented by Swedish philosopher Alberik Magnus Yngveson in 1788. Its basic idea is that governments work best when their people are as happy as possible. Thus safety first should be their watchword. They should keep and develop what they have, and not expand until they can, with certainty. They should let go of poor investments, but ruthlessly grab certain opportunities when they arise, for the good of the people and the state. Emotion and sentiment should not be allowed to stop this from happening. The state should be strong, not just to take and hold things, but also to let them go when it is necessary. And it must be flexible and admit error, as the happiness of the state as a whole, including its people, is the essential thing. Spies and secret police are an intrinsic part of Yngveson's system - or rumours of them, which have the same sort of effect on people's behaviour. Propaganda to shape the opinions of the population towards 'ideal' ends is also considered very important, leading inevitably to a need for the country to be isolated from the 'bad' ideas of the rest of the world. However, the provision of health care, including genetic health care (and eugenics), is also considered an essential. UER has as its vision a society of the maximum good for the maximum number, where people and things not required are let go without regret. This implies either a totally isolated state, or a world state under a UER regime, as anything else will have other nations taking things that the people of the nation require, or influencing its population, thus leading to conflict. The precise form which the government of this ultimate Rationalist state will take remains a matter for discussion, as long as it is one that maximises the happiness of the populace. Although most people have dismissed the ideas of UER as unworkable, even treasonable, a number of UER regimes have come to power over time, including one in Russia. However, none of them have lasted long, as [like Communism in the real world] although is has had some successes, UER requires people who are not human, and who can just let go of things without emotion. There are rumours that research is being carried out somewhere in the world to modify people's minds to turn them in proper Rationalists, though without any success so far. Most UER regimes tend to be Progressive rather than Traditionalist, although their progressiveness may not be popular with their people or the rest of the world. The symbol of UER is a white flag representing the pure light of Rationalism. An idealistic offshoot of UER, a 'universal' version rather than a utilitarian one. To this school of thought, 'our people' is all of humanity, so all the world should be united under the Rationalist banner, so that everyone can be helped. An offshoot of UER that takes an even wider view than Rationalism, considering all life to be of 'our kind', and thus the world as a whole should be helped and protected. 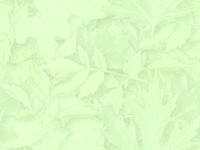 Although initially rejected by most thinkers, in later decades this philosophy has formed the basis for many of the eco-friendly policies found around the world. A variant of UER that takes a narrow view, that 'our people' is only ones immediate family, and proposes a return to the 'natural' tribal society of cave-man times. This movement has never really become popular. A socialist anti-cities movement, which became known as the Naturalists, evolved out of the French Physiocratic system of economics. Naturalists think that the nations of the world should adjust. That they should spread the factories and so on of the cities across all of the villages of the nation. They realise that industry is essential for the modern world, but insist that it is secondary to agriculture. The Holy Roman Empire was ruled by a Naturalist regime following a coup in 1880; the Naturalist regime was overthrown in 1894. Most Naturalist regimes fall into the Traditionalist bloc. This movement has a golden flag, symbolising grain and agriculture. Opposed to what they see as un-natural changes to society arising from UER, eugenics, Selección Natural Social and technological advancement, the various Naturist movements wish to return humanity to its proper 'natural' state and society, though precisely what is meant by that varies from group to group. Some of them are religiously-based, others are entirely secular; many include Luddite elements. Most Naturist regimes fall into the Traditionalist bloc. A political philosophy based on the assumption that the social order is best served and preserved by the observation of everyone, all the time, or at least the possibility that anyone could be observed at any time. It grew out of the work of Jeremy Bentham in the 1780s, and is an ancestor to UER, although it takes a different view to it. Many nations adopted Panopticon-based systems in the nineteenth century, and although these did have many successes they also led to the growth of the Nullopticon movement and the Societal Wars as a result of which most of them were dismantled. In the modern day the only major nations with active Panopticon systems are Long China and Sweden. Most of the thinkers involved in the Panopticon Movement have had a vision of a final ordered, lawful society created not through the expectation or hope of people acting rightly, but because they are constantly observed and will be punished if they deviate from the law. Some optimistic thinkers have speculated that in the far future, as people and society have had this idea become deeply rooted in them, actual surveillance might be phased out, leaving only a 'policeman in every head'. Others, more cynical, believe that this will never happen as long as people remain human. As part of this eventual aim of putting a 'policeman into every head', some philosophers of the Panopticon Movement have investigated the creation of artificial Panopticon languages, the very structure of which prohibits lying or evasion. Others have proposed the surgical or genetic modification of the human brain to the same end. So far, although some research into these possibilities has been conducted, neither idea is anything more than a hope for the future. The use of slang languages and cants [the jargon of a group intended to exclude or mislead people outside the group] such as Cockney rhyming slang, Polari and any number of new or revived cants. An increased interest in artificial and constructed languages, which very much overlaps with the use of slang languages and cants. An allied interest in extinct, rare, obscure and difficult languages from the far corners of the Earth. Code Clubs, as interest in cryptography increases. In the present day these make as much use as possible of complex mathematics and founts. The growth of secret societies and what become known as Free Speech Clubs. The Nullopticon movement is made up of a large number of highly diverse groups. As such it does not have a single agreed upon symbol. 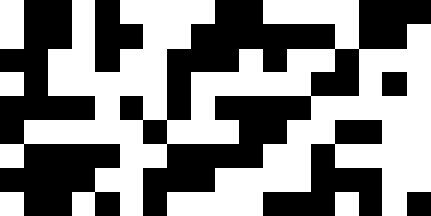 The most commonly used symbol for it is a flag made up of a random array of black and white squares, representing nothing, or white noise, and so the movements wish to avoid surveillance and so on. Originally made as a patchwork, the number of squares has changed over time, as technological advances have allowed more complex flags to be produced, but many groups retain older flags with fewer, larger squares. Note that there are also many other nullopticon flags and symbols, including designs mimicking those of punched cards or paper tape, camouflage patterns, 'see no evil' designs, and arrays of random words or characters, some of them from fictional or constructed alphabets. Although hardly a unified front, many of the various Nullopticon movements are linked with one another via the secretive World Nullopticon League, an anonymous group that maintains lines of communication and which encourages the dissemination of obfuscational technologies and systems of communication. It also provides a means by which Nullopticon movements can disseminate reports and other information on matters that they consider to be of importance to the world as a whole. Some - but by no means all - Nullopticon groups are also anarchists, who believe the best way to secure privacy and security is to remove the need for the governments who are the source of most of the threats to them. A religion and political philosophy founded in 1894 by Prajesh Badri d'Agartala, a Franco-Indian administrator from the city of Agartala in the state of Tripura in French India and working in one of the major agricultural universities near Pondicherry. This linked the then-new science of ecology with evolution and Hinduism, particularly the Karmic cycle, to create what he called Nayaa Rasta (the New Way) and which non-Hindi speakers generally refer to as Physio-Indouism (contracted to Phyndouism) or Badri-ism [as ignorant non-Muslims sometimes refer to Islam as Mohammedism]. Nayaa Rasta is based on the linkage of every living thing together into an overall living world, through which souls and spirits move by the dictates of Karma. Only right living can raise up the world and improve it and people's lot in the longer term by improving everything as people live their lives in many different forms and rise up the Karmic ladder [this is a religious form of Orthogenesis]. What is perceived as evolution is the result of this long-term improvement in universal Karma, not a driver of it. As such under Nayaa Rasta people should live morally, in tune with society and the living world around them, nurturing them both to improve everything over many Karmic cycles. Since its founding the ideas of Nayaa Rasta have spread across India and the rest of the world, despite the assassination in 1899 of Prajesh Badri D'Agartala by hard-line Hindus from a Hindu militia, leading to inter-faith violence, attempts to wipe out Nayaa Rasta, and the formation of Nayaa Rasta militias. Most Indian states and many non-Indian states have minorities of Nayaa Rasta believers of various sizes. This has not been without its problems, as in many areas, and particularly in India, there have been periodic outbreaks of religious violence between Hindus and believers of Nayaa Rasta, some instigated by one side, some by the other, as well as attempts by some governments to ban it. None of this has succeeded, however, and Nayaa Rasta is a significant force in many nations. Despite the Hindu-Nayaa Rasta violence in some places, in many others followers of Hinduism and Nayaa Rasta live peacefully side-by-side. Despite efforts to prevent it, since the death of Prajesh Badri D'Agartala, Nayaa Rasta has also schismed into several different Ways. By the present day, in addition to the Royal State of Tripura, the Indian states of Orissa and Assam are now run by regimes founded on the principles of Nayaa Rasta. Under Nayaa Rasta, Karma is considered to give a place for all, and ensure that all are born into the place appropriate to their Karma. If an individual lives virtuously their next life will be in a better place. Improving universal Karma leads to better places for all, and therefore improvement, increased order, decreased chaos and decreased suffering. Nayaa Rasta considers that no deity controls Karma, or decrees where a spirit is reborn. Instead, Karma and rebirth are intrinsic parts of the universe, beyond the influence of gods or humans. The caste into which an individual is born is considered to be an indicator of their initial Karma, that is, the Karma they inherit from their previous lives. It is not considered to be a limitation on where an individual can go from this starting point by living a virtuous (or evil) life. As such caste distinctions are not enforced under Nayaa Rasta. Linked to this, equal opportunity for all is considered to be a fundamental part of Nayaa Rasta, and with it social mobility, universal education and a degree of universal health care. This equality of opportunity and so on is part of the reason why Nayaa Rasta is popular, in particular among the poorer elements of society. Another element that makes it popular is the fact that it is very opposed to corruption at all levels of society. Universal Karma is considered to be improved not by helping individuals as such - because their station at birth is part of their Karma - but society as a whole (though there those who consider this distinction to be hair-splitting at best). Improvement in Karma is considered to come from within; it cannot be imposed from without. However, it can be encouraged or discouraged by the environment in which an individual lives. Thus part of a virtuous life is improving things for the world as a whole. That is, improving the framework in which people - and other living things - exist so that they can chose to improve and gain Karma. It is also thought that improvement in universal Karma will lead to more enlightened souls being attracted to states that embrace Nayaa Rasta, leading to a virtuous cycle of improvement. Individuals can gain Karma by helping to improve universal Karma, via raising children well, helping the environment, civic works such as improving slums, installing sanitation and parks and so on, as well as building schools and hospitals, and other worthy activities. In particular, for humans at least, this is to be done via education. Additionally, as part of improving both personal and universal Karma, Nayaa Rasta very strongly encourages giving. This can be either resources (charitable giving) not unlike the Islamic Zakat, or the giving of ones time via voluntary work. Both of these are considered to be ways of purifying oneself from greed and selfishness. Because part of Nayaa Rasta is helping and improving the natural as well as the human world, preserving the natural environment via nature reserves, and aiding the environment experienced by people via parks and gardens is also considered to be important. Since opportunity is provided but not mandated, Nayaa Rasta also considers that people choose whether to rise or fall. As such it discourages social safety nets, unemployment benefits and so on. Because of this regimes with Nayaa Rasta generally still possess at least some level of slums and other such run-down areas. To address all of these matters in a unified manner with an integrated approach for all life, Nayaa Rasta provides facilities known as ashrams that combine temples, schools, libraries, social clubs, children's play facilities, hospitals and veterinary services set in gardened grounds. The larger such ashrams also provide facilities up to a university and post-graduate level. Nayaa Rasta considers disease and so on to be part of the Karmic burden a soul must carry. Thus in its purest form Nayaa Rasta considers that the use of medicine should be guided by Karmic considerations. Therefore in the purest form of Nayaa Rasta there is no medical treatment given to disease. This includes a prohibition on eugenics as eugenic policies, and in particular euthanasia, are considered to stop the soul learning from the life it has been given, as it is in a bad place - where others might consider eugenics to be necessary - for a valid Karmic reason. On the other hand injury inflicted on an individual by others is part of the inflictors Karma and so can legitimately be treated. Of course, people do cheat on this and in most places with Nayaa Rasta regimes there are 'backstreet' doctors who will treat diseases and so on irrespective of Karma. In addition to this, in most Nayaa Rasta regimes there has, over time, been a softening of the medical prohibitions of Nayaa Rasta to make it more popular. Any increase in the human population is considered by Nayaa Rasta to be a sign of improvement in Universal Karma, as humans are considered to be more Karmically advanced than animals or plants. However, some Nayaa Rasta thinkers are concerned that future Karmic advancement of life as a whole would lead to all life becoming concentrated in (for example) humans, who would then have no other life forms to eat. To circumvent this problem, some scientists who follow Nayaa Rasta have begun to work on ways to produce nutritious food independently of any living organisms, so far with only very limited success. A minority of thinkers in the Nayaa Rasta community believe that it may be possible to improve universal Karma by using genetic engineering and eugenic techniques to improve living things of all kinds. This may attract more enlightened souls into them, thus improving Karma. However, the majority of the Nayaa Rasta community believe that it is not possible to short-circuit the process of Karmic improvement by effectively forcing evolutionary improvements rather than allowing them to occur naturally. For one thing, the actions of souls within supposedly improved bodies cannot be predicted. In addition negative Karma is likely to arise from the experiments required to develop such bodies in the first place as these will almost inevitably lead to the suffering of living things even if such work was done with good intentions and in as enlightened and non-abusive a way as possible. This raises the possibility that even were an enlightened soul to come to inhabit a genetically engineered improved body, it might well be raised in darkness and brought low by this. The possibility of genetically engineering bodies specifically for the Karmic improvement of the soul inhabiting them has also been suggested. In general these would be bodies made to suffer. Many might (and do!) call this evil, in particular people from outside the Nayaa Rasta and Hindu worlds. Even without this 'innovation', most followers of Nayaa Rasta and Hinduism consider it unnecessary at best as nature provides ample opportunity for suffering in any case. It also implies trying to take control of what is and should be under the control of the universe, which is also considered to be a bad thing. Most senior is the Sataguru ki Sataguru [Sataguru of Satagurus]. There has only ever been one universally accepted Sataguru ki Sataguru, Prajesh Badri D'Agartala, the founder of the religion, and then that level of seniority is something that was introduced after his death. With the schisming of Nayaa Rasta others have tried to claim the title of Sataguru ki Sataguru but none have done so successfully. The highest level for practical purposes is Sataguru [True Teacher], those whose life's purpose is to guide others along the paths of Nayaa Rasta. There are different seniorities of Sataguru, ranging from the leader of all of the adherents of Nayaa Rasta in a country down to the leaders of individual Nayaa Rasta ashrams. Below the Sataguru are the Acharya [Teachers], who instruct adherents in the principles and ideas of Nayaa Rasta. Under the Acharya are the Chela [Apprentices], those in training whose knowledge of Nayaa Rasta is incomplete but sufficient for them to be able to contribute to the faith and its work. This is the highest rank that can be achieved by those who have not formally joined the Nayaa Rasta organisation. The least senior adherents are the Shishya [Students], those who are newest to Nayaa Rasta or who remain ignorant of it. Within each level there are a range of sub-divisions and additional titles to reflect the different roles, responsibilities and degrees of seniority within it. In some sects of Nayaa Rasta these have become very complex and convoluted. One who devotes their lives to Nayaa Rasta and becomes a monk or a nun is known as a sadhu or a sadhavi respectively, using the same terms as for their Hindu equivalents. They wear sky-blue robes and both genders have shaven heads. The symbol of Nayaa Rasta is a stylised yellow sun centred on a sky blue field with a four-coloured triangular path leading from the bottom of the flag representing the paths and elements leading to it. 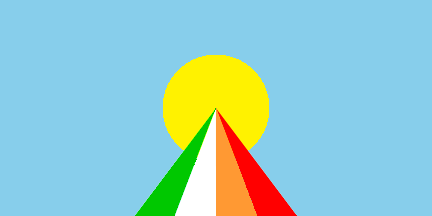 All of the colours of the flag also have significance in Hinduism, indicating the spiritual ancestry of Nayaa Rasta in Hinduism. A simplified form of this symbol is often worn as an item of jewellery by its followers. This consists of an equilateral triangle under the peak of which is a circle. A group of independent but cooperating organisations that work to maintain stocks of as many varieties of crop plants and domestic animals as possible. This is done to preserve their genetic diversity, including unique environmental adaptations, disease resistance and so on to help to ensure the food supply of the world for the future. The first Arche Gesellschaften was founded in the early 1920s by a consortium of farmers and philanthropists in the Union following the Blight, the first bio-warfare attack on crop plants. Its name was derived from the story of Noah's Ark. Since then other Arche Gesellschaften have been founded elsewhere, with particularly significant ones in France, Switzerland and the Alyesko-Siberian Federation. Although individual Arche Gesellschaften do not have facilities around the world, collectively they do. Arche Gesellschaften tend to have a head office and separate (normally large, well-protected and well defended) storage facilities where seeds and the frozen embryos of domestic animals collected from around the world are stored in case of need. Samples of new strains and breeds created via genetic engineering are also stored in many facilities. Arche Gesellschaften do not have field agents of permanent payroll. Instead they keep experts on retainer as consultants, who are brought in when required to collect (and sometimes extract) samples. Normally these are university botanists, agronomists, vets and so on, but sometimes consultants with more physical skills are required. They do have scientists on their payroll who work at Arche Gesellschaften sites to perform research, care for the stored samples and so on. As a result of the work of the Arche Gesellschaften, the crops and livestock of this world much more genetically diverse and disease resistant than is the case in the real world, with many more traditional varieties surviving than in the real world. All of this has helped to increase crop yields and feed the ten billion people of the world. They are funded by a combination of philanthropic donations and bequests, and also by charging for access to the genetic samples they hold. In addition many of them also receive money for acting as a national 'safety deposit box' of crops for different countries. Their influence over food crops and so on means that, although most of them attempt to remain neutral and apolitical, the Arche Gesellschaften have a significant political influence in the agricultural policy of many nations. Because of the name of their organisation, members of the Arche Gesellschaften are often nicknamed 'Noahs'. The Dimiphilians have a moderate but growing level of influence in the Roman Catholic church, and links to a number of other Christian denominations around the world. Despite the movements actually having grown up on the fringes of the church, in many parts of the world their effectiveness suffers from their being linked to mainstream Catholicism, which is seen by many people an instrument of the French government. Their name is an abbreviated version of 'Dimiourgiaphilians', the original name for the group that was derived from the Greek term for 'Love of Creation', Dimiourgiaphilia. El Reduccionismo [Reductionism] is a movement that was founded by the Louisianan philosopher Santiago Chocano, the son of Peruvian exiles who had fled to Louisiana after the overthrow of the Peruvian Rationalist regime in 1907. Influenced by the ideas both of UER and the Arche Gesellschaften, El Reduccionismo is a political and ecological philosophy that advocates the culling of the human population of the Earth back to a level that the Earth can sustain in the long term. Because their view of the solution to the problems besetting the Earth is very far from the mainstream of public opinion, El Reduccionismo is very much a fringe movement in most areas, viewed as either mad, dangerous, or both. Despite this, individuals and groups who follow its philosophy are widespread around the world. Many governments also agree with some of their ideas, in particular that reducing the population in the long term is a good idea. However, there are a great many issues arising from attempting to implement any such policy, as well as a great unwillingness among governments to attempt it unilaterally. They are popularly known as the 'Reapers', or sometimes as 'Chocanistas', after their founder. The Reduccionismo movement as a whole has a number of factions within it, members of which disagree with each other at least as much as they do with mainstream political views. This heavily limits their effectiveness as a movement. First, they are divided over how rapidly the population should be reduced. Some, who tend to be the most mainstream of the Reduccionista, advocate a slow reduction in population through education and the consent of the people of the world. Others see the problem of overpopulation as too urgent for such a gradual change, and instead advocate the culling of humanity quickly and immediately, by force if necessary. Other divisions exist over the level to which the human population should be reduced. Different groups propose reducing the population to somewhere in the range from one milliard [billion] down to as low as ten million. The last major source of division in the Reductionism movement is over who to cull. Some believe that culling the population at random is the best way to proceed, as this will be best, overall, for the human species as the strongest or luckiest will survive. Others take a racial (or more accurately racist) view in which (some members of) one race should be allowed to survive at the expense of the others, while others still take a view based on social class, intelligence or some other criteria; all of these are generally considered to be a more primitive and more fringe viewpoint. It is rumoured that one or more Reduccionismo groups may be planning to unilaterally reduce the population of the Earth by some means, probably an engineered disease or diseases. Because of this many Reduccionismo groups are kept under observation by the CPMM and/or the police forces of their home nations. Certainly some groups have published guides on how to survive a sudden collapse in the human population. In most countries these guides are banned, but underground copies continue to circulate. Some have even gone so far as to set up caches in certain locations to allow human civilisation to continue should a collapse of population occur, although none of these groups have been officially linked to any intended acts. Even more of a fringe group than El Reduccionismo, there are believed to be only a very few Preservadores around the world. However, because of their beliefs they tend to be kept under even closer observation by the authorities than the Reduccionistas. Again because of their beliefs, Los Preservadores have become known as the 'dark brother' of the CPMM. Despite their beliefs, the Preservadores are not nihilists, but instead want to eliminate humanity without harming the rest of planet Earth. Los Preservadores do not have an official symbol, but some groups have used an unofficial one consisting of an idyllic natural scene in a circle on a black field; the exact scene used varies depending on the group. There has been very little de-colonisation in the post-Economic Collapse period, due to the problems arising after de- and re-colonisation during that time. This has led nations to tend to see that getting rid of colonies leads to more problems later. However, the colonial powers do try to do things as efficiently as possible so there is light control and a Dominion-like status in many colonies. However, the longer ago the Economic Collapse becomes, the more effort and expense is being put into colonies as people forget the lessons learned during it. Known as the Plague Police, the Conférence Permanente De Militaires Du Monde (Permanent World Military Conference, known as the CPMM) was founded in 1953 with the signing of the Versailles Agreement to prevent the spread and use of the weapons of biological warfare around the world. It is the closest equivalent to an international political body (such as the United Nations of the real world) that exists in this world, although it only deals with matters of military technology. Originally it was nothing more than an actual conference of national representatives. 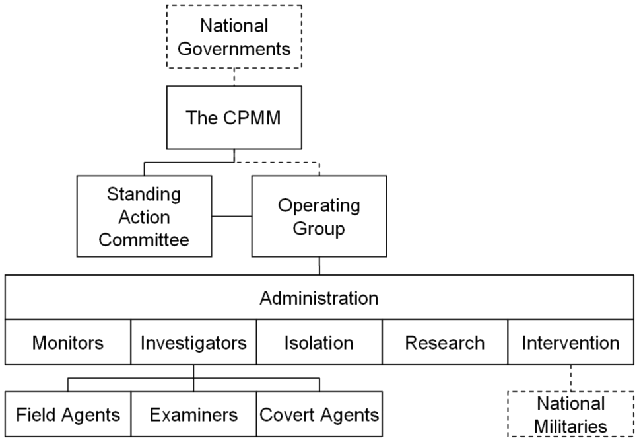 However, over time, and through bitter experience, the CPMM has grown into an extensive supra-national organisation as it has become clear that its constant vigilance is required to avoid disaster. The Comité Permanent de l'Action [Standing Action Committee] is a small group of representatives from the CPMM as a whole which is tasked with making those urgent decisions that the conference as a whole is too slow to effectively address. The main reason for this is to ensure that epidemics and other emergencies can be addressed in as timely a manner as possible. Like the Conférence itself the Standing Action Committee is based in Versailles, but unlike it is permanently in session. They report to the full Conférence as required. In parallel with the Standing Action Committee is the Groupe d'Exploitation [Operating Group]. This is responsible for implementing the wishes of the CPMM as a whole and the Standing Action Committee in particular. Like the Standing Action Committee the Operating Group is based in Versailles, is permanently in session and reports to the Comité Permanent de l'Action and full Conférence as required. The functions of the Operating Group are divided among six sub-sections, each of which is responsible for one aspect of the implementation of the Versailles Agreement. The majority of Contrôleurs [Monitors] form a large number of small local groups of some ten people each who monitor disease and health in the area to which they are assigned. Above them are regional coordinators who take reports from the local Monitors, assess them, pass data to the CPMM as a whole and raise the alarm to the CPMM if required. They exist in all nations (and their colonies) that allow the CPMM to be present and are usually locals recruited to monitor their local area. Each group monitors an area whose size is based on its population. In addition to this Contrôleurs also specifically monitor Mecca, the Vatican and a number of places in India to monitor and prevent the spreading of diseases arising from the great religious pilgrimages of the world � the Hajj, the Kumbh Mela and so on. These offices tend to have a small permanent staff that is bolstered from other offices during times when the pilgrimage is actually occurring. A more recent addition to the Section de Surveillance are the Échantillonneurs [Samplers]. They hunt for diseases before they become 'visible' to the medical or agricultural communities by randomly sampling people, livestock, crops and the environment in general. In conjunction with the Section de la Recherche they analyse these samples for anything new or unexpected (for example, a disease jumping between species). A number of disease outbreaks have been averted thanks to their being detected early via this sampling process. Some of the work of the Échantillonneurs is done in parallel with vaccination programmes; most of the rest is done in less pleasant environments, where samples are taken from human and animal corpses in morgues and abattoirs, or from crop waste, as well as from sewage and other waste disposal facilities. Because of this, the Échantillonneurs have acquired the nickname of 'Pilleurs de Tombes' (Graverobbers). The work of the Échantillonneurs and their allied Researchers has led to science in this world having a detailed mapping of the bacterial and microbial ecosystems of the world [more so than in the real world]. In addition to this, the Monitors also have Opératoire de Caché [Covert Operatives], again normally recruited locally, who work secretly over the long term as 'deep cover' agents to uncover evidence of biological warfare-related activities that governments and other groups would wish kept secret. The symbol of the Monitor Branch is a stylised eye. Agents de Champs [Field Agents], who as the name implies work out in the field. When on duty, most field agents are based at the CPMM headquarters in Versailles, but are also constantly on call, and can be sent anywhere in the world on short notice. As part of this Field Agents normally have diplomatic status, that is, are above local laws. Because the CPMM is not always welcome, but needs to be able to go wherever is required, field agents are all given some weapons and combat training, though this is, at most, to roughly the level of a police officer rather than a soldier. The public considers Field Agents to be the most glamorous part of the CPMM. Examinateurs [Examiners], who remain in the office or laboratory and work to analyse data and draw conclusions from there. Agents Caché [Covert Agents], who form the undercover intelligence element of the Investigators. Unlike the Covert Agents of the Section de Surveillance, the Covert Agents of the Section des Enquêtes work more as spies and in time-critical situations. If Investigators need a higher level of access to some area or facility than a given government is willing to give them in order to carry out their work, they will normally call on the services of the Intervention Branch. The symbol of the Investigation Branch is a stylised magnifying glass. The Section d'Isolement [Isolation Branch] consists of combined isolation and laboratory facilities where humans and animals infected by new diseases are quarantined while they are investigated and the nature of the infection determined. This is normally done following an alert from the Monitor or Investigation Branch of the CPMM. In addition to this, in the case of diseases, and in particular plant diseases, where it is impractical to transport the infected organisms to an isolation facility, they are responsible for setting up cordons around an infected area to protect everything outside the zone from that within it. That is, for containing the infection at source while it is dealt with. This is often done with the assistance of the Intervention branch. For obvious reasons these facilities are often in isolated regions, and are well guarded. As part of the core CPMM activities they are considered to be extraterritorial. As part of its work the Isolation Branch has access to mobile laboratories and isolation facilities, as well as the means to transport them to where they are required. The symbol of the Isolation Branch is a stylised set of prison bars. The Section d'Intervention [Intervention Branch] of the CPMM coordinates the activities of military forces and their transportation and logistical support seconded from member states of the CPMM to work against biowarfare threats that are detected. As such it acts as a command structure under the command of which military forces from different nations are placed as the schedule of these force rotations dictates. Because of this it can suffer problems of coordination and communication, but years of practise mean that these have been minimised as much as possible. They also, from time to time, provide backup to the Investigation or Isolation Branches in cases where those in charge of a potential disease site are ... particularly recalcitrant. In addition to this the intervention branch provides the best bio-warfare protection, handling and elimination training of any organisation in the world to those qualifying groups who wish it (and often, who can afford to pay for it). The symbol of the Intervention Branch is a stylised flame. The Section de la Recherche [Research Branch] is mainly based in universities around the world, where its researchers conduct research both on ways to detect and treat disease of all kinds, and in particular those used in bio-warfare and also on how bio-warfare might progress in the future (research that is normally highly classified), and so on what monitors might conceivably need to be looking for. There is some sharing of facilities between the Research, Investigation and Isolation Branches of the CPMM. There is also some crossover between the Research Branch and the Examiners of the Investigation Branch. The symbol of the Research Branch is a stylised book. Running over and through the rest of the CPMM is L'Administration [the Administration]. The includes all of the bureaucracy required to run and fund a body of the size and complexity of the CPMM. As it is a part of the organisation as a whole, the CPMM administration does not have a separate symbol of its own. L'Administration also provides the CPMM with the security force used for routine protection of its facilities. They wear uniforms of surgical white tailcoat and trousers, with black knee boots and gloves and CPMM-pink epaulettes with the CPMM symbol on them. All members of the CPMM are vaccinated against as many diseases as possible, including some cancers, and are subject to regular medical examination to ensure they are not harbouring anything dangerous with a long incubation period. They are recruited from across the world, with the vast majority coming from the medical, military, scientific, policing and espionage professions. France, the Union and the OSU between them contribute more than half of the personnel of the CPMM, with Israel and New Israel also being well represented due to their histories, particularly in the Investigation and Intervention branches. The official language of the CPMM is French, but because of the makeup of its members, Unionsprache and Turkish are also widely used, so the organisation is effectively trilingual. The flag of the CPMM is a pale pink field, symbolising life [note that in this world the colour pink is associated with life and vitality rather than femininity]. 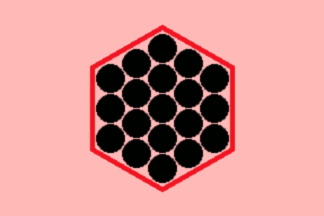 In the centre of this is a bright red hexagon containing a number of solid black circles. The circles symbolise disease of all kinds, while the hexagon is the power of science, medicine and the CPMM to contain them. When used by a specific branch of the CPMM, the flag includes the symbol of that branch in the top corner of the fly [the edge of the flag away from the flagpole]. The hexagon and black circles motif is also used as the insignia of the CPMM, and as such is used on their vehicles, uniforms, stationary and so on as required. Since the development of nuclear weapons, a number of nations have attempted to expand the remit of the CPMM to include bans on their further development or their spread to other nations. However, so far this has been blocked as too many nations see nuclear weapons as crucial to their national interest. In addition to this the French government have attempted to extend the remit of the CPMM to include a ban on the genetic modification of humans, but so far unsuccessfully. A trading and defensive alliance originally formed in 1911 with the signing of the Treaty of Alexandria between the OSU, Soudan, Egypt and Abyssinia. Since then the Concord has grown to encompass most of the nations of north-eastern Africa, linking them into an alliance that has in general greatly benefitted them all. The name of the Concord was chosen to avoid excluding any of the peoples who made it up, including Turks, Arabs, Abyssinians, Egyptians and so on. Although when it formed the Alexandrian Concord required tacit French approval, since then and with the expansion of the Concord it has grown beyond the need for this. The administrative and legislative centre of the Arabian Union is in the Abyssinian capital city of Gondar. It houses the Concord Assembly, the parliament of the Concord, as well as the other bodies of the Concord bureaucracy. The Concord Assembly is made up of ten representatives from each of the nations of the Concord and governs the Concord-wide laws and regulations (in particular the strong laws outlawing religious discrimination), and well as relations between it and the rest of the world. Beyond this, the nations of the Concord govern their own affairs and each selects its representatives to the Concord Assembly in its own way. The head of the Concord is its President, a position that rotates between the heads of state of all of the member countries on a two yearly basis. Gondar is also home of the Concord Defence League, a coordinating body for the militaries of all of the members. Its tasks include maintaining ties between the different Alexandrian Concord militaries and organising joint operations and training exercises. It also coordinates with the militaries of other nations when this is required. Since its founding, the Concord has worked to ease trade and communication between its members. This includes implementing a currency and customs union between all of its member states, and unifying the measurement systems, railway gauges, postal systems, telecommunications systems and so on used by them. Overall it is not unlike the EU of the real world. The Concord does not allow entirely free movement between its members. Some control of travel within it is considered necessary due to the significant number of illegal immigrants sneaking over the border from African states outside the Concord. Despite (or perhaps because of) this, the Concord makes significant use of guest workers from African states outside of itself; this has had the effect of improving conditions in non-AU states close to the AU as guest workers return money to them. When it was formed the Alexandrian Concord had the three official languages of Turkish, Arabic and Amharic. With the expansion of the Concord southwards into African Swahili was added as a fourth official language in 1952. Like the OSU, the Alexandrian Concord maintains cordial relations with France, although there are occasional tensions over the French colonies of La Somalie and Melinda that are entirely contained within Concord territory. The Concord has a slightly tense relationship with the government of Portugal thanks to its state of Zanj sharing a border with the Portuguese colony of Mozambique. It keeps a watchful eye on Zululand, and it is suspected that they provide covert assistance to Tswanaland and Matabeleland. Despite tensions between New Israel and the Concord in its early years the two nations have, over time, developed a number of trade, military, cultural and religious agreements. The Alexandrian Concord leads the world in geothermal energy technology, exploiting power from the East African Rift. The currency of the states of the Concord is the Concord Dinar, which is divided into one hundred Dirhams. This was adopted by the member states in 1920 and by all new members since. The flag of the Alexandrian Concord has a sky blue border representing unity around a patterned, multi-coloured centre based on a Girih tiles design, representing the diversity of the peoples and nations that make up the Concord. Go to the Clive-Less World Timeline, Society, Science and Technology or Differences Pages. 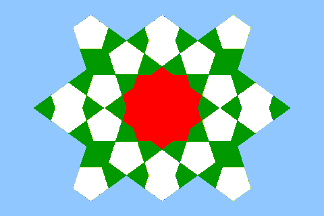 The Girih tiles pattern used in the flag of the Alexandrian Concord was made using the Girih Edit browser based Girih pattern editor. It is used here without permission but for personal use only and not for profit or commercial gain.